Five years ago, PMM introduced its readers to a little-known marine designer and his unusual ocean-going cruising yacht. The designer was George Buehler, who lives and works in wooded seclusion on Whidbey Island, in northwest Washington State. The boat was his Diesel Duck. "Diesel Ducks have not yet reached the big time," I wrote in the August 2004 article, "but they are catching on." A China builder, Seahorse Marine, had 28 Ducks to its credit, with 16 launched and 12 under construction at its plant in Doumen, as this was written. One of those boats will be used to explore the Arctic. Asboats Yachts, a custom builder in Izmir, Turkey, has begun building Diesel Ducks as production boats and recently had three under construction, including one being built to stringent EU Class A standards for offshore cruising. Both yards build Ducks with welded steel plate. In addition, individuals have built Diesel Ducks and gone cruising. Marlene and Benno Klopfer of Whitby, Ontario, who were finishing a bare aluminum hull as I researched that first article, have been plying South American waters for many months. Seaducktress, a 44 that was singlehanded from China to California, has a new owner and a refurbished interior and is cruising the Northwest. Townsend Bay Marine in Port Townsend, Washington, recently launched a 45 that has gone cruising. Harry and Vicki Borchert of Michigan built a 48 Duck of wood, an adventure that lasted something like five years, and now are living aboard much of the time. There are others, too. Buehler doesn&apos;t keep count, but he agrees the Duck&apos;s time seems to have come. The first Diesel Duck was a 38 designed and built for a California client in the early 1990s. Buehler recalls that he began design work on the Duck in November 1990 and that it took about a year. Construction followed soon after. Duck design is distinctive in these days of fiberglass yachts with swooping, sculpted, and sometimes tortured shapes. The bow is high, with not much flare. The raised pilothouse has reverse-raked windows that offer good visibility. The sheer curves aft nicely to the back edge of the pilothouse, where it rises to provide headroom in the master stateroom below decks. Compared to today&apos;s best-sellers, the Diesel Duck is a bit narrow, with a beam of 13 feet 9 inches. Her draft of 4 feet 10 inches is deeper than similarly sized craft on the market now. These features make the Duck stable and easy to move. "There&apos;s nothing new at all about it," Buehler told me. "People want something efficient-an easily driven powerboat." Powered by small diesel engines, the full-displacement Ducks sip fuel. And that&apos;s probably one reason for their growing popularity. Buehler elaborates on his website (www.diesel ducks.com): "Western America and Canada have some of the most treacherous coastline in the world, a trip to be attempted only by seaworthy boats and mariners who are prepared." He notes that countless fishing boats of 30/50 feet routinely cruise the coast, and cross oceans almost everywhere. "It&apos;s funny how many of us never notice that," he says. "I was raised in Oregon and grew up with this stuff, but it took me three sailboats and almost 30 years of boat building, owning, dreaming, and designing to see what was in front of my face: that small ocean-going powerboats were the basis for a damned good cruising boat. "Day in and day out, quietly and without attention, small seagoing powerboats prove time and again they are proper vessels for venturing out to sea, keeping their crews safe and considerably more comfortable than they would be in a sailboat." Some DD owners add a mast and sails to create a motorsailer that can breeze along with the wind, making the boat even more efficient and providing get-home capability, too. The line has grown to include a 41, 46, 48, and 55, and 46 and 49 sedan versions of the Diesel Duck. Bill Kimley, owner of Seahorse Marine, believes the sedan version may become the most popular because of its large ondeck space. Five 46 sedans were sold before the first was delivered. The sedans are considered coastal cruisers, not designed for long ocean crossings. The large deckhouse is not the best for open-ocean routes. Brian Saunders, a veteran sailor, delivery skipper, and liveaboard and a former Hong Kong resident, went to Seahorse Marine as a representative of the owner of a Diesel Duck 462 under construction there to monitor the boat&apos;s progress. He saw plans for the 382, a three-quarters-sized copy of the 462, "and I thought I had another long trip in me," Saunders said. He told Kimley: "Build one for me." Seahorse delivered the 382 (its first Duck of that size) in October 2007. Saunders&apos; maiden cruise was to the Philippines. It was time for the winter monsoon season "and the weather was a little unfriendly," he remembers. The Duck, named Traveller, had winds of 25/35 knots on the beam for three days, and she was running in the trough of 12-foot seas. "With the paravane [stabilizers], I was able to do this." Traveller has a mast and carries small boomless sails and technically might be considered a motorsailer. Not all DDs carry masts, however. Saunders was concerned the sails might overpower the boat in the strong winds and cause a broach, so he took them in and relied on the 85hp Iveco diesel engine and the stabilizers to maintain control. Sails are effective in stabilizing a boat cruising in beam seas, but the conditions Saunders encountered were overwhelming. Sails also can be considered a get-home system if the engine fails. Saunders spent four months in the Philippines and was pleased with his Duck&apos;s performance and fuel economy: 1.5gph at 6.5 knots. "Returning [to China], the weather was worse," he said. "For three days we had 38 knots on the beam with 15-foot seas. And we still ate three meals each day." Saunders had planned to cruise the South Pacific and eventually cross the ocean to his home in Vancouver. Several Diesel Duck owners have taken delivery in China (Kimley cuts the price for factory delivery by $100,000, to $399,000 for the 382) and motored to the United States or destinations in Asia and the South Pacific. Saunders&apos; plans changed, however, and he put Traveller on a freighter bound for the States. He brought his Duck to PassageMaker&apos;s Trawler Fest in Anacortes, Washington, in May 2008 and spent the summer cruising Northwest waters. Readers with excellent memories may recall Saunders and another boat named Traveller from the earliest days of PMM. Founding Editor Bill Parlatore wrote about Saunders and his 48-foot, unpainted aluminum oceancruising motoryacht in the Fall 1996 issue. That boat had been built by a California tool and die designer "to prove that a proper passagemaker could be cruised long distance more efficiently and economically than a sailboat," Bill wrote. No one would ever confuse the two Travellers, but they have some common styling elements, including a mast with steadying sails. And they both prove that powerboats can do well on ocean crossings. My 2004 article about Diesel Ducks provided an opportunity to board and inspect several and to spend a little time under way on one. With a new boat in town, I was ready to look for improvements. Traveller was backed into a marina slip, and the first change was obvious and welcome. The first time I&apos;d boarded a Duck, I had to step out over the water, plant one foot on the rung of a ladder mounted on the tall transom, and then heave myself up and aboard. It was like climbing a mountain. On the 382, I found a boarding platform that had been created by extending the hull sides beyond the transom. It also can be used to store a dinghy while under way. It was an easy step from dock to platform, and then up a ladder with steps-rather than rungs-set at a slight angle into the transom. Later, when I approached an anchored Traveller in a dinghy, the platform made boarding simple and safe. A good change. The boarding platform is one of several design modifications made by Kimley&apos;s Seahorse Marine. "Working closely with George, we have introduced many features, such as the forward-sloping pilothouse windshields, folding boarding ladders port and starboard, opening a companionway from the main saloon to the aft cabin, boomless sailing rigs, et cetera," Kimley said. "This is the nice thing about the Diesel Duck," Buehler remarked. "They keep evolving. There are so many good ideas from talented people." A striking design feature by Buehler is the Diesel Duck&apos;s unusual aft deck. It wraps around a U-shaped seating area whose open end is centered on the pilothouse door. Side decks 27 inches wide flow to the bow, with rails 39 inches high. If the crew needs to go on deck in foul weather, the wide decks and stout rails will make the journey safe. To enter the pilothouse, one must step up and through a cutout in the side wall of the U-shaped seat, then take a short step down onto the seat, and then one last long step down to the slatted teak deck. This works. But it would work better if the first step through the wall of the seat were coated with nonskid, rather than a potentially slippery glossy finish. All other deck surfaces are coated with fawn-colored truck-bed paint with enough texture to provide sure footing on wet days. There&apos;s no reason not to spread some on that first step toward the pilothouse door. Buehler and Kimley were generous in locating handrails throughout the boat, but there&apos;s nothing to grab onto while maneuvering through the seat en route to the doorway. Imagine making one step up and two steps down in rolling seas without a handrail to hang on, and you can see the need. The seating area works well. It&apos;s comfortable and protected from weather by the bulk of the pilothouse forward and a hard top overhead. It would be a fine place to relax with a book and a beverage on a sunny afternoon at anchor. The door to the pilothouse is watertight and, in case you&apos;re wondering, any water that splashes into the seating area is carried away by a 3-inch drain in the deck. The open step area of the side wall is notched to accept boards that will help keep out water in rough weather. There&apos;s a large, opening port in the aft wall of the seating area, providing light and ventilation for the master stateroom below. This port, like others on the boat, was borrowed from China&apos;s commercial maritime industry. Kimley said the gear meets requirements of the International Convention for Safety of Life at Sea (SOLAS) for the construction and operation of commercial ships. A passageway flows through the center of the pilothouse; to port is a settee that also functions as a pilot berth. The helm seat and a cabinet with a top large enough to hold a spread-out chart are to starboard. Ocean-capable cruisers often have small windows, but the Diesel Duck pilothouse has a generous array of large windows that provide plenty of light and a sweeping view around the horizon. She also carries window cover plates for those really rough days at sea. Grab bars attached to the overhead will prove helpful in bad weather. A niche ahead of the wheel is just large enough for the single Raymarine navigation monitor chosen by Saunders and for the engine gauges spread before it. The table fronting the settee is mounted on a 4-inch stainless steel pipe that also carries outside air to the engine room below. The table is just the right size for a plate of sandwiches and several coffee mugs for the on-duty crew. Stainless steel columns on either side of the stairway leading forward support the upper deck and mast. Usually, Seahorse Marine covers the sole with a teakand- holly veneer, but Saunders chose carpeting. The teak cabinetry is precisely fitted and glows softly under a smooth finish. The overhead&apos;s fiberglass paneling resembles the V-grooved planks you might have found on old salmon trollers and workboats. There is no door to the outer deck from the helm area on the 382. Moving from the pilothouse to the head, saloon, and staterooms on the lower deck requires navigating six steps, all with red courtesy lights. A handrail helps. At the foot of the stairway, you&apos;ll find yourself in a warm, comfortable space-call it a lounge, call it a saloon. Doesn&apos;t matter. A dining table is to starboard, and a casual chair to port offers easy access to bookshelves, with plenty of space for stretching legs. One semicircular corner of the table has been cut away to ease access to an adjoining locker housing electrical gear, including an isolation transformer and batteries. Normally I favor locating that kind of equipment outside the engine room, as long as it&apos;s easily accessible. But this space looks awkward to reach for repair or service; the bottom of the locker door is about even with the tabletop, and the transformer and batteries are below that, near deck level. Saunders said the 12-volt AGM 8D batteries are "removable by hand," but my view is that it would take an Olympic weightlifter to reach down and make the hoist. A stainless steel pipe running through the center of the table carries diesel fuel from a fill port on deck to five steel tanks below the saloon deck. The 382 normally carries 1,200 gallons of fuel, but Saunders ordered extra tanks to increase capacity to 1,750 gallons. That&apos;s enough for long, long voyages: up to 6,825 nautical miles without refueling, assuming a speed of 6.5 knots, a fuel burn of 1.5gph, and a 10 percent reserve. For those who spend a couple hundred hours annually coastal cruising, it&apos;s probably too much fuel. Opening portlights and a skylight brighten the saloon, and an oil-burning Dickinson Marine stove on a forward bulkhead warms the space. Moving forward, the marine toilet is in an enclosure to port, and the shower is to starboard. The fuel manifold sits beneath a panel in the sole in the passageway. The guest stateroom is located in the bow, with two stacked berths to starboard and storage cabinets to port. A washer is neatly hidden behind tambour doors. A passageway on the port side leads from the saloon aft to the galley, master stateroom, and engine room. The galley, two steps down from the saloon and along the outside of the passageway, is equipped with a toploading refrigerator, a three-burner propane stove, a large stainless steel sink, cabinets, and a Corian counter. A top-loading freezer is a few steps farther aft, in the master stateroom. The stove is not gimbaled, but Saunders says that isn&apos;t a problem. If he&apos;s cooking while Traveller motors through swells, he braces his backside against the opposite wall and his feet against the counter base and is able to reach the stove and work areas. A water tank sits beneath the galley counter. Saunders asked Seahorse to paint the side walls and overhead of the galley white to reflect light from a portlight at counter level. The engine room adjoins the galley, and the disconnect switches for the main engine and generator starting batteries are on the inside galley wall (which separates the galley from the engine room). I&apos;m 6 feet tall and I bumped my head on the top of the doorway each time I ventured aft to the stateroom. The door is watertight and has four stout handles that dog it shut. The finishing work is thoughtfully planned and well done. The cabinetry is teak, but the side walls and overhead are white and reflect the light from six opening ports. This is important in a space that is mostly underwater and where standard windows cannot be provided for views and light. The watertight engine room door opposite the foot of the bed is perhaps 5 feet high, but once in the engine room I found 6 feet 4 inches of head space. A workbench is on the starboard side, with a water tank beneath. (The steel tank has a huge inspection plate that will make cleaning easy, if it&apos;s ever necessary.) There is room for a folding bicycle aft of the tank and for other gear and a water heater forward of it. The forward bulkhead is devoted to a Spectra watermaker and its associated filters and a pair of variablespeed pumps that provide fresh and sea water on deck. One of the nicest additions to new boats has been the growing use of labels to identify wiring, plumbing, pumps, and switches. The 382 has none that I could find. A four-cylinder Iveco NEF 100 diesel engine rated at 84hp and a single-cylinder Apollo 3.5kW generator share a compartment in the engine room. The Iveco is the product of a subsidiary of Fiat in Italy. Kimley and Saunders praise its performance and reliability and note that the engine meets EPA Tier II emissions requirements without the use of a turbocharger. However, Kimley said parts and service centers for the Iveco engine are just being developed for the cruising world. An option would be a John Deere diesel. "We love the John Deere engines," Kimley said, adding that he installs them exclusively in his company&apos;s line of 52-foot fiberglass Seahorse trawlers. "However, they require turbos and some electronics...which many bluewater cruisers do not want." The hull was sprayed with expanding foam insulation. Engine room noise is minimized by two layers of foam separated by a band of lead. Seahorse-built Ducks have a wet exhaust system, stainless steel shafting, a PSS shaft seal, and a drip pan beneath the engine. Electrical wiring runs through conduits. All circuits are protected from ground faults by a breaker in the electrical panel. Traveller has a propane galley stove, but a refrigerator and freezer create a sizable energy load. The pair of 8D AGM house batteries, coupled with recharging from the genset, can meet the demand. A pair of solar panels atop the pilothouse will do the job, too. The panels, each rated at 75 watts, are extra-cost options offered by Seahorse Marine. Saunders says he can lie at anchor indefinitely, with lights and refrigerator operating, and the photovoltaic panels will keep the batteries charged. "If I use the freezer, I need to start the generator every third day," he said. This is a smart addition to a boat&apos;s electrical system and should appeal to cruisers who like to anchor in solitude in remote coves without enduring the sound of a generator. The panels will reduce the consumption of diesel fuel, which is an important green benefit, but the peace and quiet offered may be equally important from both an environmental and a personal standpoint. 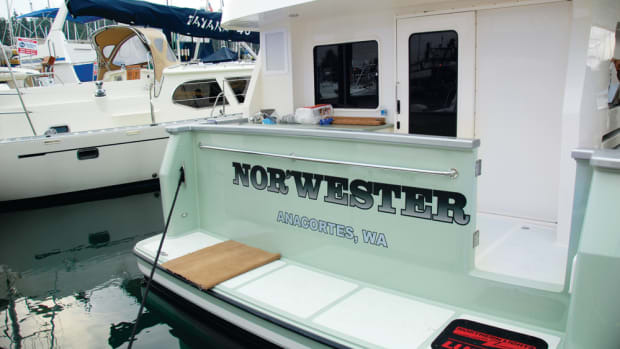 I recently toured a new 49-foot American Tug equipped with optional solar panels sufficient to power basic lighting and one of the boat&apos;s two refrigerators. Sailboats long have carried solar panels, and this may be another good idea being adopted by powerboaters. Air conditioning is important for ocean cruisers with southern seas in mind. Seahorse Marine will install 18,000- Btu air conditioners/heaters at a cost of $3,500 a unit. Saunders, a self-described minimalist striving for low-cost simplicity, paid $600 for a rooftop Coleman air conditioning unit designed for motor homes and trailers, and Seahorse Marine mounted it atop the Duck pilothouse. It is powder-coated white and works well in the marine environment, Saunders said. He needs to run the generator to power the unit. On that upper deck there is also an innovative device for feeding cables from mast-mounted radar and radio antennas through the pilothouse roof: a goosenecked stainless steel pipe. The straight end is attached to the roof, and the other end has a U-shaped curve several inches long, with the open end looking down at the deck. The wires feed in easily, and there should be no worry about rain or flying spray flooding up into the pipe. I&apos;ve seen similar cable entry devices on other boats, and they seem to be effective-and simple. The stainless steel handrails consist of three parallel horizontal bars supported by the usual vertical stanchions. The designer obviously had ocean cruising in mind, because it would appear impossible for anyone to slip overboard in poor sea conditions. The rails also are fitted with vertical steel pins that resemble sailboat belaying pins in appearance and function. Saunders uses them to stow lines neatly. Atop the deckhouse, just forward of the starboard windscreen, I found a circular steel plate larger than a dinner plate bolted to the deck. On top of it is a slightly smaller cap labeled "diesel." Twist the thumbscrew latch and lift the plate to find the fuel-fill pipe. This, you&apos;ll remember, is the pipe that helps support the dining table in the saloon. It runs below the saloon deck and feeds fuel to five tanks in the bilge. Why, I wondered, is that steel plate bolted to the deck? This is a steel boat, so why not weld it down? I looked around and discovered that the perimeter of the deck is lined with bolt heads. Same question. The answer is that the forward cabin top is wood, and the line of bolts holds it to the steel framing below. My prediction is that some day, maybe 10 years from now, those exposed bolt heads-no matter how well they are bedded-will leak water into the interior of the boat. The wood top and bolts are a Seahorse Marine construction feature. Kimley told me they have had no problems with the wood tops, but he added that they now build the attaching studs into the top so there are no visible bolt heads. He will also use steel plating or cored fiberglass for the top panels of the house. Kimley says steel Ducks are built to strict standards of the China Classification Society that require stability tests and X-ray examination of welds to assure quality work. There are no standards in China like those of the American Boat & Yacht Council and of the European Union (CE) that focus on system design, construction, and installation. Seahorse Marine follows the voluntary standards of the ABYC and many of the mandatory CE requirements, except for a few that Kimley says he disagrees with. He didn&apos;t elaborate, but he said one of his problems has been in using an isolation transformer that was designed and built in China but that isn&apos;t ULlisted for marine use. Some surveyors have raised that issue, Kimley said, but he believes it is a quality product. He said he also refuses to replace the Chinese-built SOLAS-approved doors and windows "with inferior products that have the required CE [European] stamp." Seahorse Marine uses long sheets of steel to minimize seams and fairing effort. The hull is shotpeened or sandblasted inside and out before painting. The interior receives three coats of epoxy primer before the topcoat is applied, while the bottom is given four coats of primer. Doors, hatches, ports, and windows are made of painted aluminum. Kimley is a veteran China boatbuilder. After graduation from the University of California, Berkeley, and years of work in research management, he moved into yacht sales, working for a San Francisco Grand Banks dealer. He soon opened his own business and began selling, then distributing, yachts built in Taiwan. In the mid-1980s, he sent a 52-foot mold to a shipyard in China. Back then, he said, Halverson Marine was the only other boatbuilder there. "I soon realized that Chinese shipyards at that time could not build to acceptable yacht quality," he said. "My Chinese wife, Stella, and I decided to build yachts ourselves, first renting a corner of a state-owned yard and later building our own factory. With a lot of help from Stella and her family, I have found it easy to do business in China." Today, Seahorse sells Diesel Ducks to buyers in the United States, Canada, Asia, and Australia. Despite worldwide economic distress, Kimley is upbeat. "I think the sales of fuel-efficient trawler yachts and motorsailers will hold their own, or maybe even increase," he said, adding that his 2008 production capacity was sold out by February of that year. Saunders fell for the Diesel Duck while observing construction for an owner. Even though it adds slightly to the total cost of a new boat, hiring a person who&apos;s skilled in yacht building and applicable industry standards to make several inspections of a boat during construction is a good idea, regardless of who is building a boat, or where it is being built. That technical person also could be helpful in drafting a construction contract and in determining specifications. Traveller&apos;s blue hull and tanbark sails make her a handsome yacht. The simplicity of her systems should appeal to many. 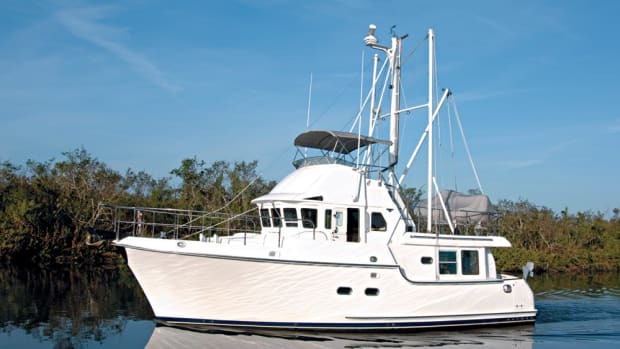 Buehler reached back decades to proven ocean-going fishing boats for inspiration in designing the Diesel Duck, and that simple, attractive, and functional styling also is appealing. Ducks are slow boats but they also are efficient, and one could cruise all summer without going broke at the fuel dock. Many boaters, including this writer, have learned that slowing down to reduce fuel burn does not diminish the pleasure of cruising. I last saw Traveller on a fall day as she lay at anchor at Port Townsend, Washington. There was a wood boat festival going on in town that weekend, and Saunders had come to tour the classics. We traded email messages later, and he boasted a little about the boat&apos;s performance-under power and sail-as he headed toward Seattle. A northerly was blowing at 12/14 knots, and he found that his southbound Duck would make 4 knots with the wind aft of the beam. "I was coming down Admiralty Inlet with only the jib out [and the motor running]. At 6.5 knots, I pulled the revs back 400 to 1100 and still held 6.5 knots," Saunders wrote. That&apos;s a kind of cruising most of us have not experienced. But it&apos;s good cruising. HOLDING TANK 40 U.S. gal.